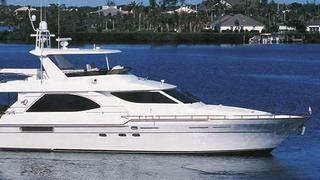 News now from All Ocean and Gilman luxury yacht Miss Shuga now for sale. Built in GRP by Canadian yard Queenship Yachts to an in-house design, she was delivered in 2004. A centerline two panel sliding aluminum door provides the entrance to the yacht’s saloon. Starting at the starboard side aft is a three shelf fiddled open bookcase. A chest high, gloss cherry countertop is next forward and has four drawers followed by two cabinet doors concealing a portion of the yacht’s entertainment equipment. This includes a Yamaha audio visual stereo receiver, a Direct TV receiver with a Sony Blu Ray player, all expertly built into a rack system. The saloon also includes comfortable seating and a pop-up 48 inch LG HD television. Accommodation is for six guests in three staterooms consisting of a master suite with a Jacuzzi tub, a VIP stateroom and a twin cabin, all with LCD televisions and full en suite facilities. The impressive flybridge has port and starboard L-Shaped seating in front of two teak tables for al fresco entertainment and dining. Twin 1,400hp MTU engines give her a cruising speed of 18 knots. Lying in South Florida, Miss Shuga is asking $1,290,000.